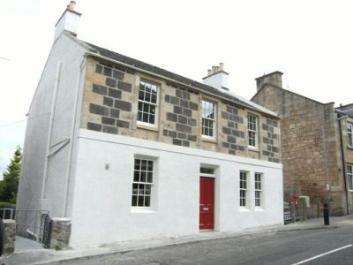 The owners submitted their building for the Stirling Civic Trust award – and won! The judges at Stirling Civic Trust’s biennial Architectural Competition took an unusual step in giving the award for the best restoration of an old building to a traditional Scottish house in Cambusbarron, which has been restored by its owners. The awards were presented Wednesday 4th May by the Provost at a reception in the Drummond Room in Old Viewforth, Stirling. Here is a simple building in the sort of conservation area which all over Scotland is being eroded by careless or misguided alterations. Restoration is not only about a few large high profile enterprises, it is also about the owners of thousands of small buildings making good decisions and having the courage to follow them through. See our Project Case Study for information on the works.